If you are looking to be a Computer Programmer then you will be experienced in computer programming languages and have some solid work experience under your belt. You may write program in languages such as Visual Basic, C++ etc. You will need to keep up to date with new languages and ways of doing things as the world of IT moves very quickly. You will need to have a logical mind to work with computers and have a great deal of patience to solve problems. You will also need to be able to explain your work in a non technical way to those who do not understand the language but need to know how something works. I would like to apply for the role of Computer Programmer which I have seen advertised in (where) (When). I began my career in the world of IT in (when) since then I began in a general role (any qualifications or specialisms) and then got into the programming world. I work on a number of different systems writing new code for databases, till systems, warehouse operating controls etc. I am always keen to learn new skills and like to keep on top of the developments within IT by whatever means I can. I understand IT but I understand that other people do not and I feel that my communication skills are very good and that I can explain technical detail to non technical users. I am also able to do reports and present my findings and how I feel the best way of going about a new project is. 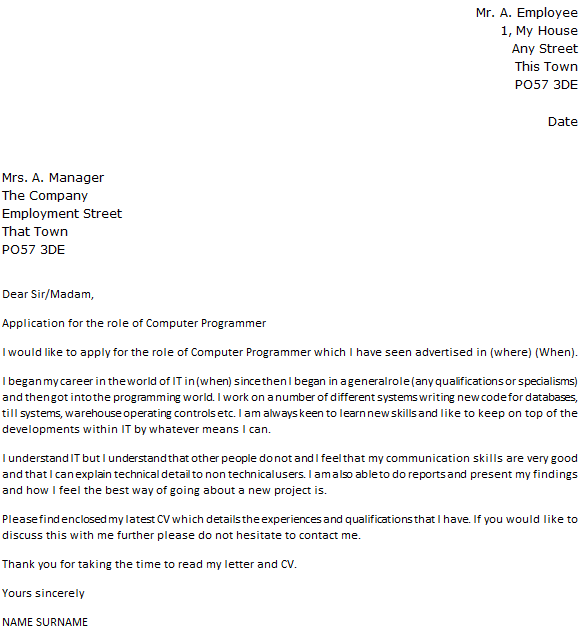 Please find enclosed my latest CV which details the experiences and qualifications that I have. If you would like to discuss this with me further please do not hesitate to contact me.